The people at Design Coalition don't want to change the world. Just a little part of it. Through planning and building design they hope to do their part in keeping Madison - especially its existing neighborhoods--an alive and vital city, attractive to its many and varied residents. 1. "The Reservoir," a much-praised group of mixed-income cooperative apartments in the 600 block of East Dayton Street that began with a horse stable. 2. A new Prairie-style residence hall at 1901 University Avenue that was honored last year by the Capital Community Citizens. 3. An ecologically friendly annex to a bed and breakfast, the Arbor House, 3402 Monroe Street. 4. "The Avenue," an inventive renovation (plus a new addition) that created apartments in an old UW building in the 1900 block of East Washington Avenue. 5. And, because one has to have some fun along the way, Art-Deco 1950s-style Michael's Frozen Custard stand at 3826 Atwood Avenue. "We have a mission," said Lou Host-Jablonski, an architect who has been with Design Coalition for 18 years. "What is very important to us is the community of Madison. We work on buildings and on planning issues that we believe will have a positive impact on the community. When we begin to get involved in a project, we look at the organization of the people we're working with and their goals." Design Coalition is a nonprofit architectural and planning firm that has been operating here since 1972. It designs multifamily housing, new homes and additions, community-built projects, group homes, community centers, child care centers and playgrounds and home modifications for persons with disabilities and chemical sensitivities. "We're unusual in that we are one of 30 to 35 community design centers left in the country, almost all of which are much larger cities," Host-Jablonski said. · When, for example, a cooperative housing plan is developed, such as the Reservoir mixed-income cooperative apartments in the 600 block of East Dayton Street, someone has to do the architectural work. It started with an old horse barn at the corner of Dayton and Blount. Now there are 28 apartments, including two units on the second floor of the old livery. The first floor holds offices for Madison Mutual Housing. "These are designed to complement the existing neighborhood, which has many two-flats," Host-Jablonski said. One apartment building has six units, another eight units, but they are designed in such a way that they look like separate buildings. This project has been included in a new book,"Design Excellence in Affordable Housing." · The Prairie-style residence hall on University Avenue was designed for the Association of Women in Agriculture. The contemporary building has three stories but masks its size with its wide overhangs. Twenty-six students live there. "We designed it a s a series of apartments, to encourage collegiality among the students," Host-Jablonski said. "It enabled us to build in common spaces while retaining privacy." The third floor is a large suite, with private rooms and a large common space. "It has received quite a bit of praise," Host-Jablonski said. · The Arbor House annex, part of the three-room bed and breakfast that opened in 1840 as an inn, was designed to include materials as ecologically friendly as possible. The wall material is called Faswell, in use in Europe. It is made of 85 percent recycled material and is very durable, with a projected 100-year useful life, Host-Jablonski said. The timber frames of a breakfast room are recycled from an old Sears Roebuck & Co. warehous in Chicago. The Annex is designed to be energy-efficient, comfortable in summer even without air conditioning, and with solar heating. It won a national design award last year. · For the Avenue apartments for the disabled, Design Coalition remodeled what had been the UW neurological hospital -- and before that a quarantine hospital built in the 1920s -- at 1954 E. Washington Avenue. The Avenue has 26 apartment units in the old main building, eight units of new construction and four units in an old boiler and laundry building. In 1989 - 1990 this was state-of-the-art wheelchair-accessible, even before modern standards were set," Host-Jablonski said. "We created an environment where everything is accessible except for four walk-up units in the new building. This is a project that has done well." 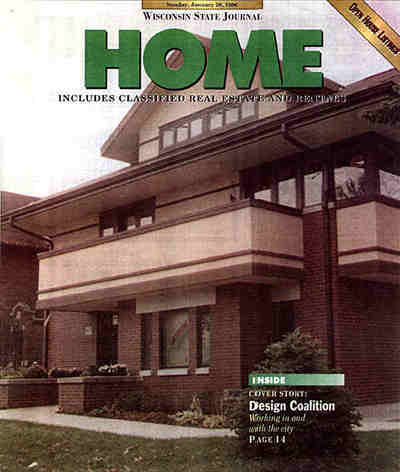 In 1991 the Avenue won a design award from the Wisconsin Institute of Architects and was described as "a victory in housing for the handicapped in Wisconsin Architect magazine. · Why did Design Coalition do Michael's Frozen Custard? "Michael's has a commitment to the community that's unique and that's what attracted us to them. "Their young workers are obviously respected and having a good time. As a business they do a lot of donating to local causes. Our thinking was, "This is a business with a social conscience, the kind of people we want to work with." The old gasoline station building was a challenge on a tight site, Host-Jablonski said. The owners wanted the industrial-metal siding exterior. The interior carries out its '50s-style decorations with an accent on bright red and white. "When I take grade-school children on slide tours to show our work in neighborhoods, this is my favorite project to go to, obviously," Host-Jablonski said. "They love the place, not only for the custard, but for the exterior and interior design. It's a wonderful place to finish a tour." Over the years, the city of Madison, with its Community Development Block Grants, has supported nonprofit organizations doing a variety of things. Mayor Paul Soglin, especially in his early years, had a commitment to nonprofit organizations "that made a huge difference," said Lou Host-Jablonski, an architect with Design Coalition, one of those nonprofit groups. One of the grants enabled Design Coalition to provide technical and architectural services to low-income and moderate-income people and to the organizations that serve those people. Over the years, Design Coalition has been involved in planning improvements in Dunn's Marsh, the Williamson-Marquette neighborhood, the Bassett neighborhood near campus, Wil-Mar and South Madison. Host-Jablonski said concern over retaining and promoting neighborhood viability has become greater in Madison in recent years. "As Madison has grown, as the population has become more prosperous, those are issues that are going to be facing us," he said. "We're not in crisis stage yet, in terms of our planning choices. Madison stays a good, livable place." As a demonstration of that, Design Coalition last year did much of the work in putting together the Alternate Parade of Homes tour in the Schenk-Atwood neighborhood on the near East Side. "It's still vital, still a good place to live,"
Host-Jablonski said. "We should be learning from the past, how to create livable places. Well, we've got those places, and Schenk-Atwood is one of them. It has seen a renaissance in the last decade. Monroe Street and Williamson-Marquette are others. "If you have a planning department and neighborhood involvement, it might be easier to do something like Middleton Hills in the central part of Madison," Host-Jablonski said, referring to what is to be an old-style residential-commercial neighborhood in Middleton, developed by Marshall Erdman and associates. "It's definitely doable." Design Coalition supports the "co-housing" concept, in which a limited group of people design their own neighborhood. Co-housing takes considerable planning, work and, perhaps most important, vision. "It has been going on in Scandinavia for some 20 years," Host-Jablonski said. "It is an idea that has caught fire in the United States. Some 200 groups across the country are working on such projects. Madison has at least two groups working on this. We did workshops a few years ago where we had over 300 people interested in co-housing."